Water Friendly Woven Wrist Lanyards! The adjustable woven wrist lanyard comes with a soft and comfortable to wear, round woven cord. 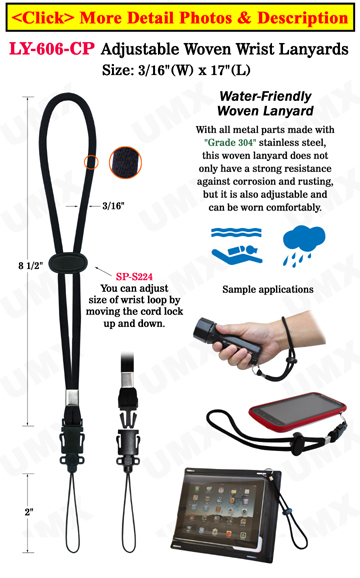 Each wrist lanyard comes equipped with a stainless steel spring cord lock and a stainless steel coupler. This item is great for harsh and wet environtments with a strong resistance against rusting. This adjustable item is not only for cellphones, it can be used with phone accessories as well. The universal string attached at the end of the strap can be used with your flash player, flash drive, flash media, USB drive, memory card, camera, handheld PDA, GPS system, meters and related accessories, etc. Custom Size: Any custom length or design available.